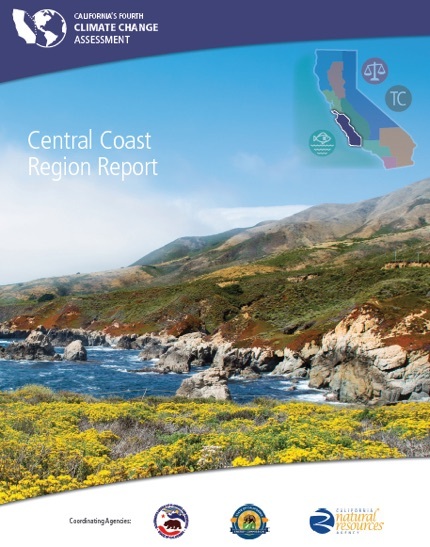 For the first time, the latest periodic report incorporates in-depth regional assessments, including one for challenges faced by the Central Coast. Ruth Langridge, an associate researcher in the Politics Department, was the coordinating lead author of the Central Coast Region Report; she convened a panel of expert contributors to report on impacts to water, ecosystems, energy, transportation, public health, agriculture, and other sectors. "The Central Coast is over 90 percent natural lands, and we examined in detail the climate change impacts to the many ecosystems in our region," said Langridge. The report identifies how climate impacts will affect residents and communities, as well as what the region is doing to adapt. Highlights of Central Coast impacts include sea-level rise; drought and water-supply shortages; wildfire; wildlife disturbance; impacts on streams, rivers and aquatic life; loss of beaches to erosion; heat-related illness among agricultural workers; and significant impacts on agriculture, particularly the Salinas Valley. UCSC contributors include Dan Brumbaugh, associate researcher in the Institute of Marine Sciences; Yihsu Chen, associate professor of technology management; Na Chen, a former UCSC postdoctoral researcher who is now an assistant professor of planning at the University of Cincinnati; Laurel Fox, professor of ecology and evolutionary biology; David Herbst, a research biologist with the Institute of Marine Sciences; Michael Loik, professor of environmental studies; Mark Snyder, project scientist in the Earth and Planetary Sciences Department; and Barry Sinervo, professor of ecology and evolutionary biology. In addition, Gary Griggs, distinguished professor of Earth and planetary sciences, was a lead author and the working-group chair of the California's Coast and Oceans Summary Report. The statewide report warns that two-thirds of Southern California’s beaches could completely disappear and the average area burned by wildfires could nearly double by 2100 and provides planning tools to support the state’s response. "In California, facts and science still matter," said Governor Edmund G. Brown Jr. "These findings are profoundly serious and will continue to guide us as we confront the apocalyptic threat of irreversible climate change." The authors summarized the state of the science on observed and modeled climate change including temperature, precipitation, fog, extreme storm and drought events, and the impacts on sea level rise, runoff, wildfire, and floods. The compilation of original climate research includes 44 technical reports and 13 summary reports on climate change impacts to help ready the state for a future punctuated by severe wildfires, more frequent and longer droughts, rising sea levels, increased flooding, coastal erosion and extreme heat events. The peer-reviewed research translates global models into scaled-down, regional reports that fill information gaps and support decisions at the local, regional, and state levels. California has completed three prior Climate Change Assessments. Since the release of California’s Third Climate Change Assessment in 2012, the state has experienced several of the most extreme natural events in its recorded history, including a severe five-year drought, an unprecedented tree mortality crisis, damaging floods driven by atmospheric rivers, and increasingly large and destructive wildfires. Wildfire: Climate change will make forests more susceptible to extreme wildfires. By the year 2100, if greenhouse gas emissions continue to rise, one study found that the average area burned by wildfires would increase 77 percent and the frequency of extreme wildfires burning more than 25,000 acres would increase by nearly 50 percent. In the areas that have the highest fire risk, the cost of wildfire insurance is estimated to rise by 18 percent by 2055. Additionally, the percentage of property insured in California would decrease. Sea-Level Rise: Under mid to high sea-level rise scenarios, up to 67 percent of Southern California beaches may completely erode by 2100 without large-scale human interventions. Statewide damages could reach nearly $17.9 billion from inundation of residential and commercial buildings if sea-level rise reaches 20 inches, which is within range of mid-century projections. A 100-year coastal flood, on top of this level of sea-level rise, would almost double the cost of damages. Updated modeling can help local planners analyze vulnerabilities in their area. Energy: Higher temperatures will increase annual electricity demand for homes, primarily for use of air conditioning units. High demand is projected in inland regions and Southern California. More moderate increases are projected in cooler coastal areas. Increases in peak hourly demand during the hot months of the year could be more pronounced. This is a critical finding for California’s electric system, because generating capacity must match peak electricity demand. Extreme Heat Events and Impacts on Public Health: Heat-related illnesses and deaths are projected to worsen drastically throughout the state. By mid-century, the Central Valley is projected to experience heat waves that average two weeks longer than those today, and the hot spells could occur four to 10 times more often in the Northern Sierra region. A new California Heat Assessment Tool (CHAT) could support public health departments as they work to reduce heat-related deaths and illnesses. In addition, a report set for release in early September will highlight how California can better integrate climate impacts in design processes for critical infrastructure. The report by a working group established by AB 2800 (Quirk) of 2016 reflects the expertise of multiple scientific and engineering disciplines to help design and construct infrastructure to withstand higher temperatures, more frequent and intense storms, drought, wildfires and sea-level rise. To access Fourth Assessment technical reports, summary reports, online tools, climate projects and data, and other resources and information developed as part of California’s Fourth Climate Change Assessment, go to www.ClimateAssessment.ca.gov. California is a global leader in using, investing in, and advancing research to set proactive climate change policy. Its climate change assessments provide the scientific foundation for understanding climate-related vulnerability and how Californians may respond. The Climate Change Assessments directly inform state policies, plans, programs, and guidance to promote effective and integrated action to safeguard California from climate change. California—which is playing a world-leading role in building strong coalitions of partners committed to curbing carbon pollution in both the United States and around the globe—will convene the Global Climate Action Summit in San Francisco next month. At the summit, representatives from subnational governments, businesses and civil society will showcase the surge of climate action around the world, and make the case that even more must be done.